Woodhall Spa CC ended the weekend as runners-up in the Lincs ECB Premier Play-off Trophy. The newly-introduced competition sees the top-four finishers in the division play a knockout competition over two days to conclude the season. But after reaching the final, the Spa men found Grantham too strong. Things began well for Woodhall as Joe Irving dismissed Ross Carnelly first ball, but his replacement Matthew Dowman went on to score an unbeaten 148. Jaden Fell added 65 before being dismissed by Irving, while James Keast’s 31 helped the hosts to 265-2 off their 50 overs. 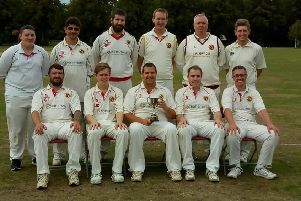 Woodhall were dismissed for 125 as Grantham claimed the trophy. Irving top scored with 41, supported by Henry Wilson (25) and Brandan Laurenzi (22). Saturday saw Woodhall shock unbeaten champions Bracebridge Heath to book their place in the final. The Spa men posted 288-6 thanks to good scores from Harsha Vithana (86), Joe Irving (69), Prasanna Jayawardene (53), Ollie Caswell (33), Henry Wilson (15) and Thomas Dixon (15). Irving led the way with the ball, taking five wickets for the loss of 35 runs as Bracebridge were all out for 153. Alex King and Prasanna Jayawardene took two wickets apiece and Irving also claimed a run out. Woodhall Seconds cemented second spot in the South Lincs and Border League Premier Division as they completed their season with victory at Skegness. The visitors left the seaside with a nine-wicket win. Skegness were dismissed for 34, with the Spa men replying with 37-1. 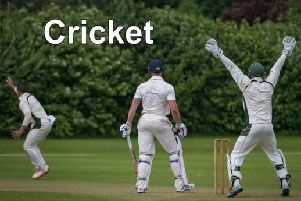 Woodhall Sunday Firsts will be in Lincoln and District League Premier Division action this weekend, away at Revesby Firsts (1.30pm).